I recently posted about some of my favorite Target florals, so I wanted to follow up with a few outfit pictures showing some of the items on a real person. Sometimes the details don't translate on studio photos, but as you can, these items are really adorable in person! I discovered A New Day at Target back in fall, and since, continue to love their styles. So when I came across the two items above while browsing online, I knew I had to have them. The cardigan features embroidered mesh and the blouse has sewn on applique details making it 3D. They both expensive but are very affordable - thank you for that, Target! Are you a fan of A New Day at Target? Since January and February in Southern California has mostly been in the 80s, it's felt more like spring than winter. Maybe it's the blossoms everywhere, but flowers have been on my mind. Which is perfect, because right now Target floral prints are plentiful and I can't get enough. Here are my favorites. I have the green and white blouses and cardigan and they are even more gorgeous in person! However, the cardi and tank run small. I have a large bust so I had to get plus sizes in both (plus links provided in parenthesis). Just something to consider. A few of my friends have actually complained that recently Target clothing has been running small. Anyone else have that problem? It's a little hard to tell in the photos, but all of the clothing items have fun features. 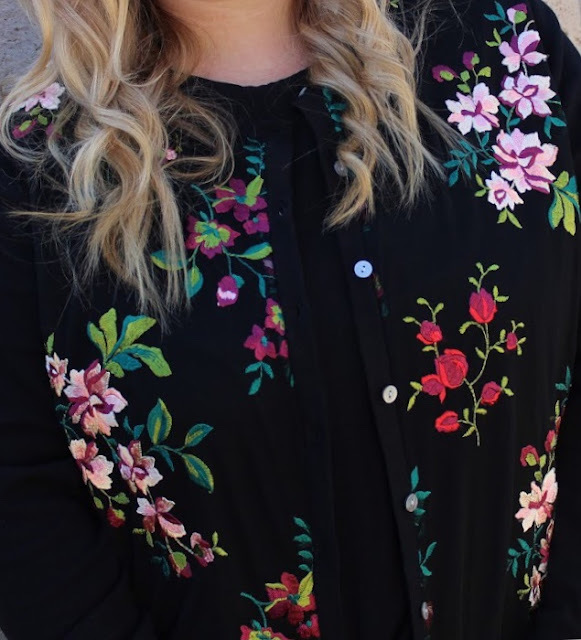 The cardigan has embroidered flowers on mesh and looks very expensive. The green blouse has a unique, playful sleeve detail, And the white tank is 3D with flower cutouts sewn all over. From ghost to food tours, I am a big fan of traveling with a guide to maximize my exploration. It's a great way to see sights that you may not otherwise know about. That was exactly the case during my recent LA Art Tours Downtown Los Angeles Graffiti Mural Tour. For years I've seen art on the side of buildings in LA, but I didn't know much about it. I decided to find a tour that provided an insight to the beautiful images. After seeing reviews highly recommending LA Art Tours, I knew it was the company to go with. I'm so glad I selected LA ART Tours because the afternoon was even better than I had anticipated. Over the course of two-and-a-half hours, our amazing guide, Shandu One, walked the group through the streets and alleys of the DTLA Arts District, shedding light on the history of graffiti, pointing out a variety of art pieces, and explaining the techniques used to create the pieces. As a pioneer of graffiti art, Shandu One is a wonderful source of knowledge and did a great job showing us the sights and answering questions. Tour guides' personalities play a large part in the experience and his connection to the neighborhood and friendly demeanor added to the appeal of the tour. It was really interesting to hear how kids in the 80s were turning from gangs and drugs and starting the LA graffiti scene. It's an entire culture with rules of respect. For example, they get permission to create their murals and know better than to paint over peers' work. How incredible are these pieces? It's hard to believe that they were created with bottles of spray paint! Check out the detail up close vs. a few dozen feet away. The first mural just looked like faded lines (in the lip area), but when I backed up I was blown away by the bigger picture. We learned that painting on these metal doors are especially hard due to the curves, making the impact that much greater to the audience. 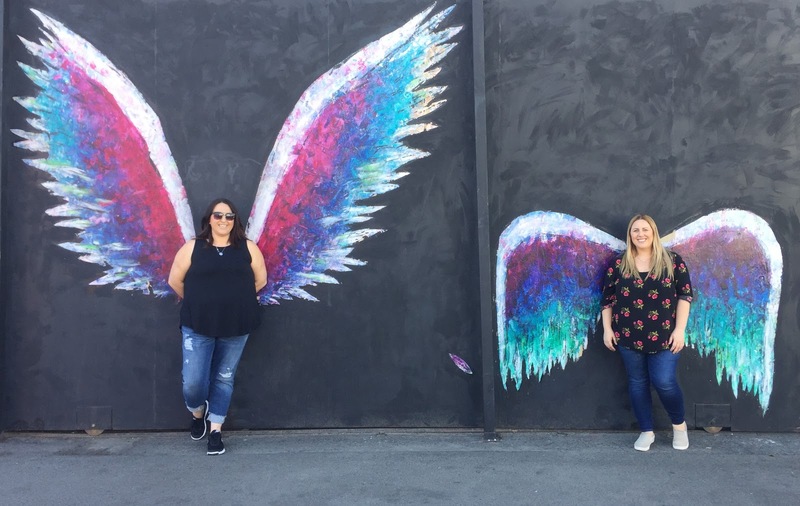 A week after the tour I had out-of-town visitors and took them to see some of the murals and a pair of the angel wings that everyone loves posing with, thanks to the info provided by Shandu One. It was a hit. This tour is perfect for locals and visitors alike! The Graffiti Mural tour is a very affordable $12. Can't beat that for over two hours! LA Art Tours also offers a Brewery Art Complex Tour, Alley Adventure Graffiti Bike Tour, and more. Check out the calendar to select a tour and purchase tickets.